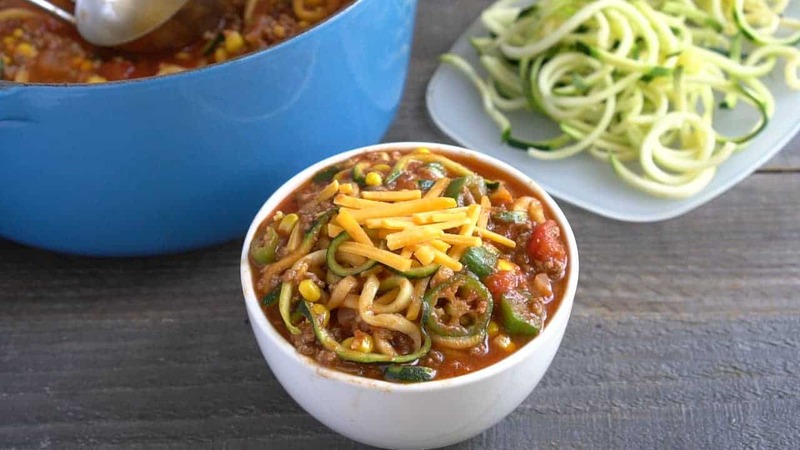 Healthy Goulash – with Zoodles! 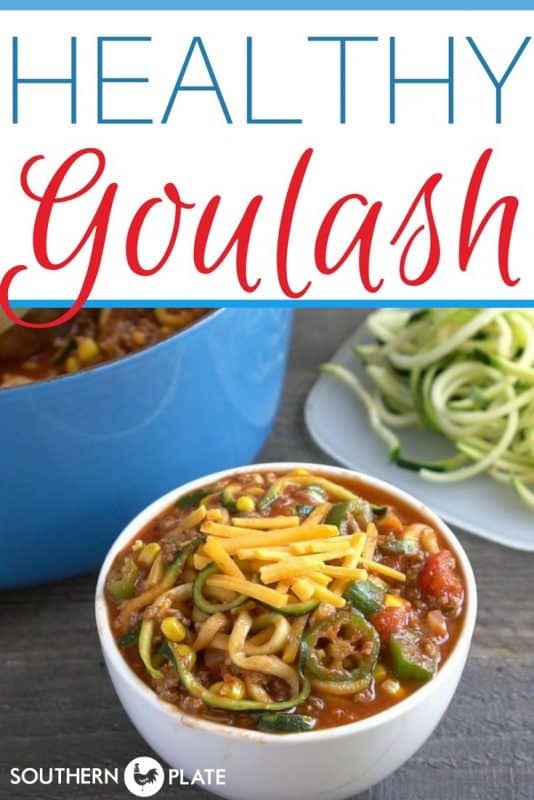 Healthy Goulash is a healthier and lower carb version of one of my favorite recipes! For those of you who have been with me a while you may have caught wind of the fact that there is this one goulash recipe that is the beginning and the end for me. I dearly, wholeheartedly, love it. Almost to the point of writing sonnets and putting a ring on it. Well, we try to keep it more on the lower carb side these days. (Note, I said low-er) With that in mind, I tweaked my recipe to enable me to eat copious amounts of goulash without fear of reprisal from those mean old carbs. I also pumped it up with more wonderful veggies, adding in okra* and zucchini noodles in place of the pasta. Thus, this is a healthier version, made convenient with a mixture of canned and fresh veggies, that can also be made entirely with seasonal veggies, too! I hope you get to make it soon! I actually like this version better than the original! *If you’re an okra hater (I respect that, because that means more for me) you are free to substitute a veggie of your choice in it’s place. This is a very versatile recipe so switch around the veggies to suit your preferences or to make use of what you have on hand. In a large dutch oven brown the ground beef over medium high heat until it is not longer pink. Drain the grease. Add the onions and garlic to the meat and reduce the heat to medium. Cook until the onions are translucent. Add the tomato sauce, drained diced tomatoes, zucchini, okra, paprika, salt, and pepper. Reduce heat and simmer uncovered for 15 to 20 minutes, stirring occasionally. I would definitely give this a try. Doesn’t hurt to try an old favorite a new way. Where do you get the zoodles? I’ve never seen them at the grocery store. Thanks and will try this soon. I think they are fairly new. I’ve bought them at Wal Mart and at Kroger. Really handy things! You can also get a spiralizer and make them yourself, which may be a great option if you grow it in your garden. Christy, thank you so very much for mentioning frozen zoodles are available at WalMart. Have been wanting to try them. I have been comparing reviews of spiralizers over at Amazon and it’s a real mixed bag of good/bad. I have pneumonia right now and this looks delicious. Gonna try it soon. By any chance, do you have the nutritional facts for this recipe? Thanks! Is the taste still similar to regular goulash with macaroni pasta? Do you have the nutrition values for this recipe the way you made…. lower carb with the zoodles? I am trying to look at recipes to make that have lower carbs so knowing the carbs helps with all the recipes you post. Love your recipes! I generally leave nutritional calculations to the reader as recipes tend to be adapted and this one, especially, has many options based on what you have on hand and quantity of veggies used – not to mention serving size. However, myfitnesspal.com is a wonderful website (free) that I use for my own nutritional calculations. You can just input the recipe and then choose amount of servings and it will calculate for you. You can also switch out veggies to see how that will affect the count if you want to get lower. I hope this helps and thanks for being here! You can feel good about eating this on a low carb diet, because zucchini has way less carbs and calories then pasta. In fact, with this recipe you could eat 2 bowls and still feel great, because it’s mostly vegetables. If your aim is no bread, rice, or pasta, this is a winner. Enjoy. In addition to my fitness pal you may want to check out the glycemic index of foods, so you can look at a recipe and have an idea of how high or low carb it is. I have followed Christy’s Southern Plate from the beginning of her blogging years ago! It seems that you just keep getting better as the years go by! I have started watching carbs more closely now too & love the zucchini noodles (zoodles) I didn’t know you could buy them frozen but will be looking for them! Can’t wait to try this recipe! And I love Okra too! As always, Christy, you are right on time with another.great recipe! For some reason I’m not able to Pin this for Pinterest? Just added this to my Pinterest board for soup and stew. Thank you Barbara, you’re the best!! I’m trying to follow the low-carb meals as well, and this looks like it’s very adaptable for it! Thank you Christy for yet another great recipe! My husband will definitely like this one, did someone say OKRA …. he loves it. Very anxious to try this recipe. Thanks for sharing. Let me know what you think when you get to try it Loretta!! I loved the version with pasta, but wanted less carbs. Making this recipe now. Found zoodles at Kroger. I noticed that a can of drained whole kernel corn is in the ingredients list, but not in the directions. I remembered to put it in. It would probably be fine without the corn. The goulash smells great. I will be able to try it soon. I hope you enjoy it Shelley!! The original (pasta recipe) does have corn in it, and you can choose to add it or not in this version. Without makes it even lower in carbs which is what I meant to say, I will have to go fix that 🙂 Thank you for letting me know!! This recipe makes Hungarians weep.